OpenCart 2.0, a feature packed eCommerce platform can help your site in better conversions and product sales. E-Commerce platforms are the blood supply for the numerous eCommerce companies and are driving the product sales and conversion rates around the world. Although, the list of these platforms are huge but not every platform is built to provide you a “kickstart” in this eCommerce business. After scanning several platforms, we have zeroed in on this OpenCart 2.0 extension which is a upgrade of the previous OpenCart platform 1.5.6 but is exciting in more than one way. It was released on 1st October, 2014 but has become the “darling” of various OpenCart development services since then. Some of you might not be sure about our choice and would proclaim that we have made the choice in a hurry. So, in order to erase all your doubts, we are providing you a detailed account of this OpenCart upgrade that is simply amazing in various aspects. This OpenCart 2.0 platform is built on latest Bootstrap 3 functionality at core level. Due to this integration, your eCommerce store is now more sleeker in design, intuitive and powerful for both desktop and mobile devices. Fully responsive feature of OpenCart 2.0 ensures that it is easily accessible on multiple devices. Mobile users are increasing day by day and thus they needs to be targeted effectively for improving your product sales and conversion rates. With this new responsive design, you can make your OpenCart site look more appealing and have similar user experience on multiple devices like desktops, laptops, smart phones and devices. OCmod feature allows easy website changes without making any changes in the core files. Now, OpenCart web developers can effortlessly make desired modifications on their site without any requirement of making changes in the core files. With this feature, you can easily upgrade to a new version without affecting the customization done by you. All this has become possible due to the integration of OCmod in this OpenCart 2.0 extension which does not require any separate installation of files. For more information regarding OCmod, do check out this informative link. Use Font Awesome support for a professional and visually appealing OpenCart site. For providing a unique and amazing look to your OpenCart site, you can now take the help of this advanced CSS font collection that consists of 400+ icons known as Font Awesome. These superb icons can add a professional look to your website to grab the effective customer attention and conversion rates. All you need to do is just add the required icon class and you will get a cool icon displayed on your site. 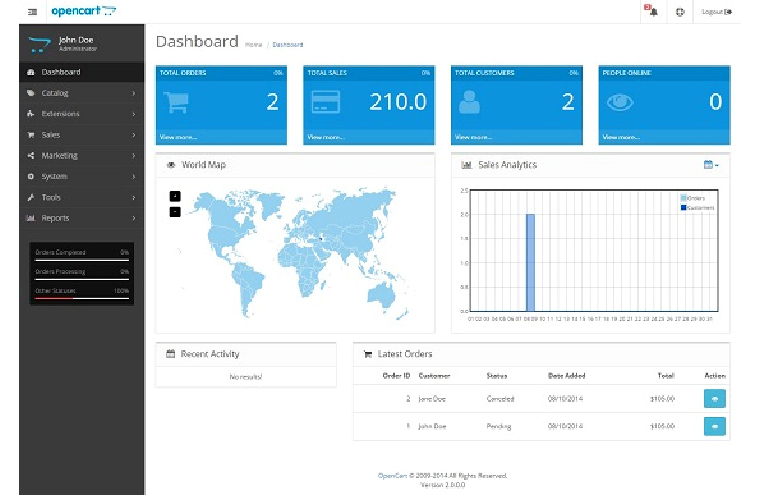 This new intuitive dashboard focuses prominently on features like sales analytics and people online. This new intuitive dashboard design has grabbed the fancy of various OpenCart web developers as it helps in focusing the important elements of your eCommerce business. It is now easier to keep track of the sales analytics and online people for improving your business fortunes. Furthermore, this new dashboard design is more user friendly in nature and allows seamless interaction with the system. In addition to this, the old horizontal menu option is replaced with the new vertical menu that allows smart navigation facility around the website. So, people who are thinking about making a foray into the eCommerce business segment, need to take the right step by availing the OpenCart development services like Velocity that has years of experience, talent pool of skilled OpenCart web developers, knowledge about the latest OpenCart 2.0 extension and other web technologies for providing you a mind blowing eCommerce website. For more information about this OpenCart platform, do visit the next part of this blog- OpenCart 2.0- An amazing eCommerce platform to scale new business heights- Part 2.